It’s easy to crowd a holiday appetizer table with too many heavy dishes. Something like this can sneak a fresh vegetable into the mix in a way that makes a dramatic presentation. It’s really simple too. 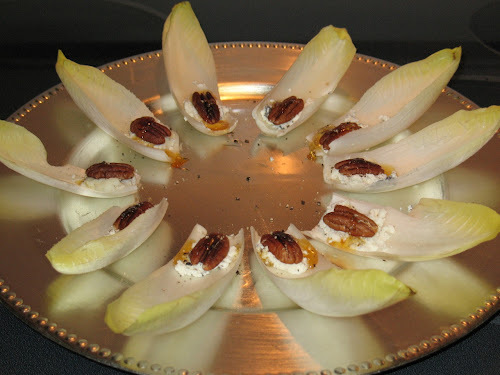 Endive lends itself to appetizer creativity. The leaves when carefully peeled off resemble spoons. So the question then is what to put in that spoon. Lots of possibilities. Here I’ve done something pretty simple: spread a smear of soft goat cheese on the leaf and top it with a drizzle of honey, a pan-roasted pecan and some fresh ground black pepper. 1. In a small frying pan over medium-low heat, toast pecans until fragrant, about 10-12 minutes. Set aside to cool. 2. Arrange endive leaves on a platter. Spread a couple teaspoons of goat cheese near the cut end of each leaf. Place a pecan half in the middle of the cheese, drizzle with honey and sprinkle with freshly ground black pepper. These are always really good!